(February 27): Our original plan to leave for Columbia on Monday, February 25th, was thwarted by Winter Storm “Rocky” blowing through Eastern Kansas and Western Missouri. Based on daily reports of weather and road conditions from the Weather Channel and from Patty & Chris, we decided to delay departure from Cleveland by two days. Fortunately, this delay gave us time to clean up the house a little, and make sure we were fully prepared for the trip. 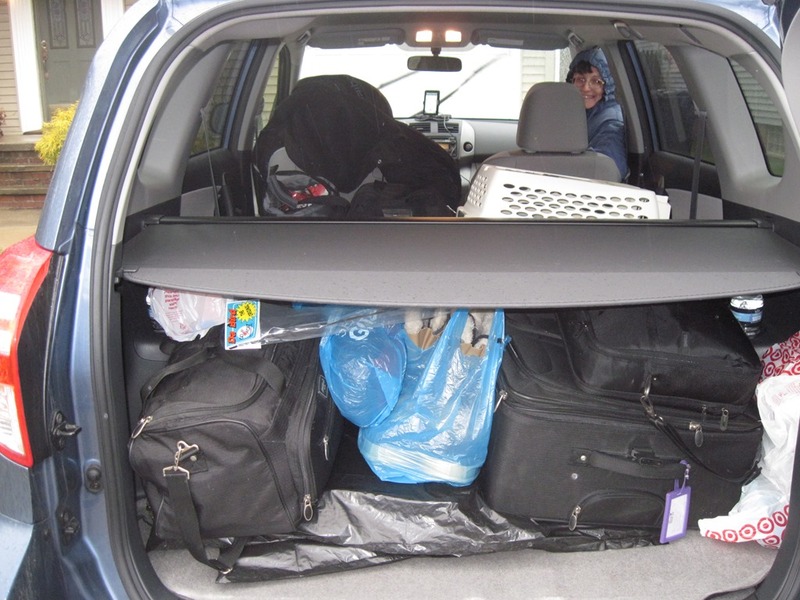 We spent the morning of Wednesday, February 27th finalizing our packing and loading up the RAV. 2:24 pm EST: Departed Lyndhurst, Ohio. Mileage reading on the car at 6,132. Temperature 43 degrees F, with a light rain falling. After a brief stop at the Post Office, we were on the road, headed South on I-271 grooving along to the band No Doubt on the iPod. The trip South on I-271 to I-71 to Columbus was marked by rain, sleet, and a light snow. Around Mansfield, we switched over to Bon Jovi’s greatest hits, and by 4:39 pm EST were starting to circle Columbus on I-270. At one point, the road was 6 lanes wide just in the westbound direction! ~4:45pm: Somewhere on the west side of Columbus, between the Hilliard exit/entrance and the Tuttle Crossing exit/entrance, we were ALMOST clobbered by a young lady driving a blue Honda Civic, license plate FPE 9101 (Ohio). She had her cell phone up to her left ear and obviously wasn’t paying any attention to the lanes of traffic beside her as she drifted in from one of the entrance ramps. We wailed on the horn repeatedly, but she kept coming, drifting over to our lane. Fortunately there was no one in the lane beside us so we were able to swerve to avoid the collision. We slowed down, and drifted back behind her, giving her a wide berth … and we called 911 to report it. The 911 operator directed us to Hilliard Police, but we got disconnected before we could make the full report. ~4:52 pm: We were in the Southwest corner of Columbus and turned off I-270 West onto I-70 West, the road which would be our main thoroughfare to Columbia from here on out. Weather was a mix of light snow, sleet, and rain, and by now we had switched the iPod over to Annabouboula. 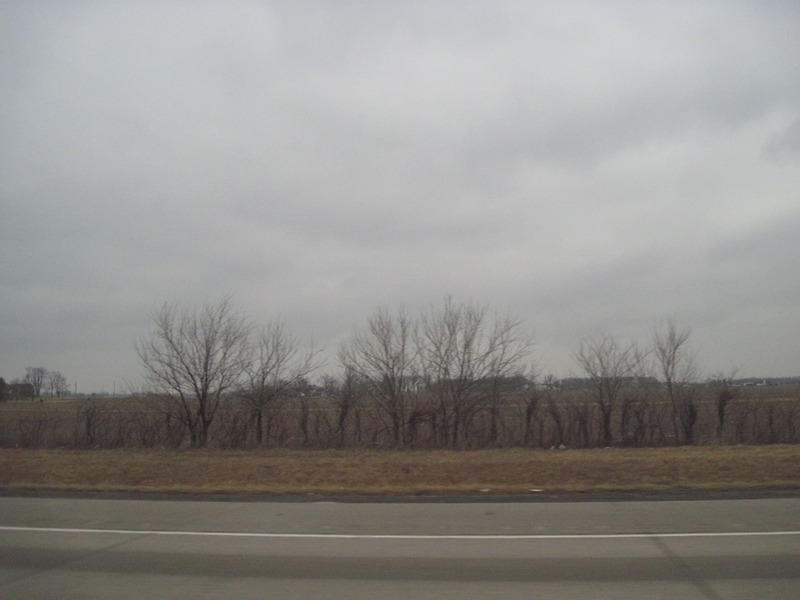 Not much in the way of scenery in this part of Ohio. Flat land. Barren fields. No snow at present. 5:50 pm: We were just outside Dayton and made our first stop. At this point, 3-1/2 hours and 219.3 miles into the trip, we decided to stop for dinner at Englewood/Clayton (SR 48). We were about ready to gnaw off our arms we were so hungry, so we stopped at a Bob Evans. Safe food for travelling and good prices. 6:35 pm: Back in the car, strategizing our next leg of the journey and calling ahead for hotel reservations in the Indianapolis area. We stopped for gas, too. Gas here for 87 Octane was $3.80 a gallon. By 7:02 pm we were back on I-70. 7:31 pm: Crossed over from Ohio to Indiana. It was dark, so we didn’t photograph the crossing. Temperature was 33 degrees F, and we were 240.9 miles from home. We had a pretty steady dose of light snow all the way from the state border to the Indianapolis area while driving at night. By the time we hit Eastern Indianapolis, we were ready to get off the road and drop into bed. We had made reservations to stay at one of the La Quinta hotels in Eastern Indy. In fact, it was the same hotel we plan to stop at on the trip back with Patty and the animals. Arrival time was somewhere around 9:00 pm. Our odometer read 308.0 miles from home. Weather was light snow. We checked in, checked some emails, and then plopped into bed by 9:35 pm.